Figure 4-15. - Buck-arm construction. Figure 4-16. - Side-arm construction. Figure 4-17. - Standard flat-strap crossarm brace. 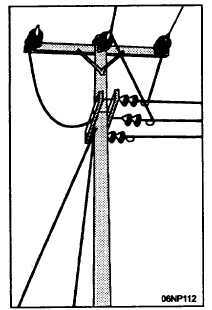 arms are used at comers and at points when branch circuits are taken off at right angles to the main line (fig. 4-15). Braces are used to give strength and rigidity to the crossarm. Metal crossarm braces are made of either flat bar or light angle iron. The size used varies with the size of the arm and the weight of the conductors. The usual flat-strap brace for ordinary distribution work (fig. 4-17) is 38 inches long and 1/4 by 1 1/4 inches. 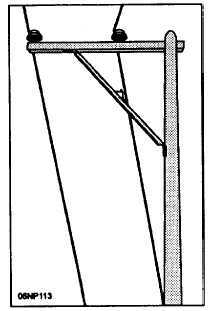 One end is attached to the crossarm by means of a carriage bolt and the other to the pole by means of a lag screw. Figure 4-18. - A V-shaped angle-iron crossarm brace. Figure 4-19. - Crossarm brace installation.